Before mass-production began in the nineteenth centuries and even into the beginning of the twentieth century, pharmacists created medicines in-house. For centuries they rolled pills by hand. This labour-intensive process began with a doctor’s prescription that indicated the weight of every ingredient needed to produce one pill as well as the number of pills required to treat the patient. Based on this information, the pharmacist measured and ground up the required medicinal ingredients using a mortar and pestle. Next, he added a wet or dry binding agent, such as soap, milk powder or glucose syrup, to create a pliable paste. The paste was then formed into a thin cylinder (called a “pipe”) and placed onto a “pill tile” where it was cut into equal pieces. The rough pills were rolled between the pharmacist’s thumb and index finger to achieve a spherical shape. He could also use specialized tools such as “pill finishers” (flat wooden disks spun over the pills) or pill rounders (containers in which pills were shaken) to further refine pill shape. Pharmacists could coat pills to disguise the flavour of the medicine, making them easier to swallow. Depending on how much the client was willing or able to pay, thin gold or silver leaf, calcium carbonate (to achieve a pearl finish), sugar, or gelatin could be used. Many of these coatings made the pills indigestible. As a result, they would pass through the digestive system whole, without delivering medication. 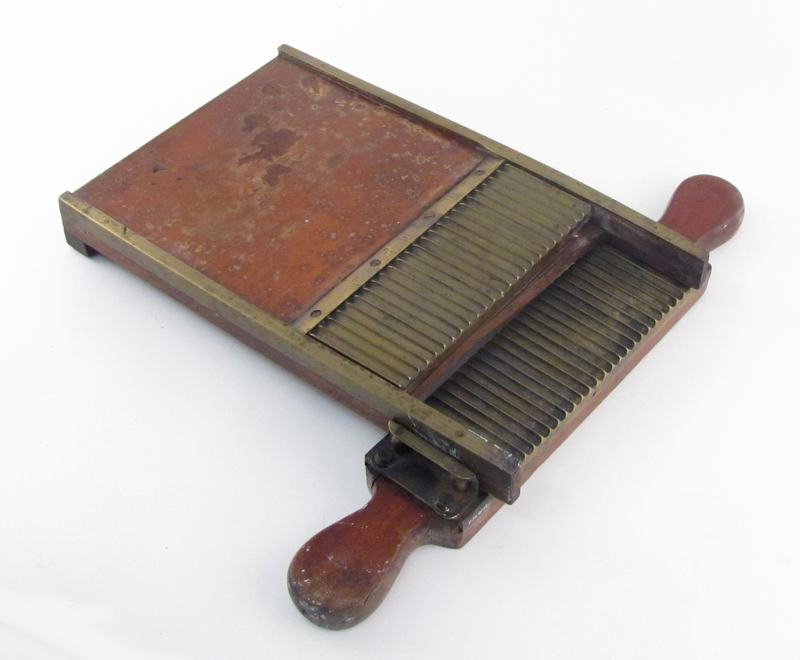 It was not until the nineteenth century that pill machines, equipped with brass pill cutters (such as the one pictured here) arrived in Britain via mainland Europe. The pill-making process became more efficient as a result of the introduction of this new technology because the machine cut the “pipe” and rolled the pills into rough spheres all at once as the plates were pushed back and forth over the paste. Pill machines were available with a number of different plates that cut the “pipe” into varying sizes, often from one to five grains (or 65 to 325 mg). The pill machine pictured here is equipped with brass and wood plates for making pills of six grains (389 mg) in size. 1. Anderson, Stuart, ed. Making Medicines: A brief history of pharmacy and pharmaceuticals. London: Pharmaceutical Press, 2005. 2. Cowen, David L. and William H. Helfand, Pharmacy: An Illustrated History. New York: Henry N. Abrams, Incorporated, 1990. 3. Homan, Peter G. “Pills and Pill-Making.” Museum of The Royal Pharmaceutical Society Information Sheet 7. Royal Pharmaceutical Society: London, 2002. http://www.rpharms.com/museum-pdfs/07-pills-and-pill-making.pdf. 4. Massachusetts Institute of Technology. “Dissolvable Pill.” Inventor of the Week Archive. MIT Online. http://web.mit.edu/invent/iow/upjohn.html. 5. Worchester City Museums. “Pill Making Machine.” City Art Gallery & Museum – Steward’s Chemist Shop. Worchester City Museums Online. http://www.worcestercitymuseums.org.uk/mag/chem/objmas/chem02.htm.